Railway authorities have introduced a system where one can complain from a running train. 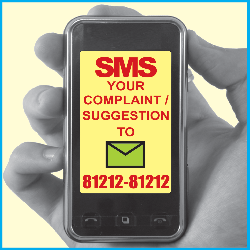 The SMS about complaint will be acknowledged & attended. Give the train no. precise nature of complaints like no water in bath room / no light / fan not working / security problem or whatever through sms. it is an effective tool. The railway number to which U can SMS is 8121281212 . This is a great news for the convenience of the passengers. Indian railways improving gradually. Good Indian railways is improving. Also now PNR status of trains can be checked on IRCTC website. India me train time table kbhi nhi sudhr skti. Sab sale chor hain. @Vinay sudhregi bhai, dhire dhire, .. ab modi aa gya hai. Thank a lot for sharing this valuable information.... It will prove great help to the passengers..
Hello dear sir, abhi- abhi humko hijde log bahut presan kar rahen hai, sab passenger se 20 & 50 ₹ wasool karten hain , inka koi kanoon nahi hai . Train no. 12512 Rapti sager exp. Bogi -S4 seat no. 50, 51, 52 , 53 . I am travelling in train no.11071 nd this train is running to much late bt on rail2ay website it reaches it's destination in 23:05. How irresponsible they are..?? Good information provided. To complain, you can send a direct email to IRCTC. However, it’s trying hard to help passengers with PNR Status app, online train booking, check seats and more. Check Southern Railway PNR Status with the easiest way. Gundia Mfp express train mostly become late in its way due to sinal problems in its path even after having a long travelling journey thoughtout the destinations its makes passengers more irritated due its late timing in reaching station. Today train no. -15232 gundia Mfp exp. Became 9hours and 20 min late sometimes it's very problematic to the passengers to reach there works on time.